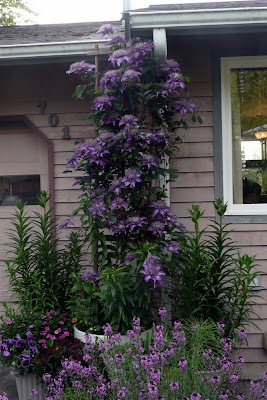 I think the clematis likes it's home. The pots of lilies on either side should be pretty showy this year, they came back twice as tall as last year! I think the purple wallflowers (in the foreground and opposite side of the front walkway) are going to have to be transplanted to somewhere else in the yard, they are too tall and hide the pond from view.